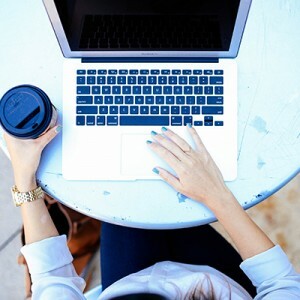 How is Your Blog Writing Going, Today? 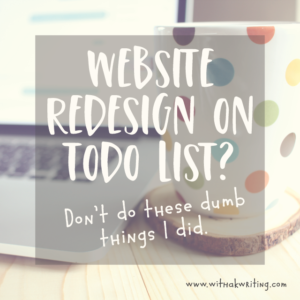 Are you sitting in front of your computer, with a cup of coffee in your hand and one of the best seats at Starbucks, only to stare at the blinking cursor on your screen – your fingers paralyzed on the keyboard? Or do you prefer to sit outside in the sun holding your beautiful new Moleskin notebook in your lap, with a glass of iced tea in hand, only to stare at the white, blank page, feeling like anything you write there will only ruin the journal? Don’t blame the blank page, you just aren’t ready to start writing yet…also, can you pass me that coffee? Writer’s block is one of the worst things to happen to a writer. 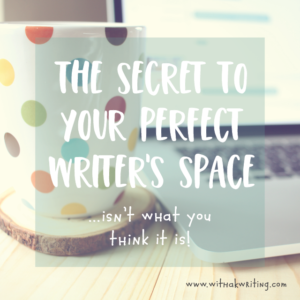 It doesn’t matter how many books you’ve written, how many posts you’ve created, or even how many writing classes you’ve taught (ahem…that last one’s me) – writer’s block *will* get you, but there *is* a way to defeat it. It’s really so simple, actually, that it will kind of blow your mind. Writing should be approached in a simple step-by-step process. If we follow the steps, it is *so* much smoother, freer, more efficient and less painful. Writing well does require skill, but skill and talent mean nothing if you don’t follow the right process – and you won’t gain that skill, experience and sense of language you need, without practice. *HINT* – staring at the blinking cursor on the screen or at the white, empty page? That is *not* practice. What we usually do, and what causes us all kinds of stress and pain and honestly hatred, is we try to do all of the steps at once. It doesn’t work that way. We might get something written in the end, but it is likely to be unorganized and ineffective, and it probably doesn’t even say what we wanted it to when we sat down. We also probably had to sit through a session of self-loathing and disgust at the white empty page to get it. Not nice. It’s simple: you just have to stop. Stop trying to do everything at once. It doesn’t work, and it makes you sad, so STOP IT! 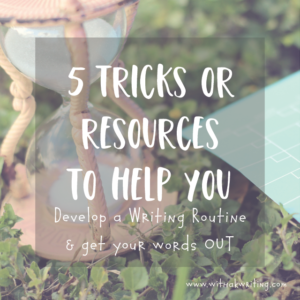 There is a straight forward 5 Step Writing Process that you should be using to make writing free and comfortable and even FUN. Over the next few months, I’ll get into this whole “Process” thing, and you will be cruising through your moleskin in no time. All of you! There isn’t a writer out there who couldn’t benefit from using this process. 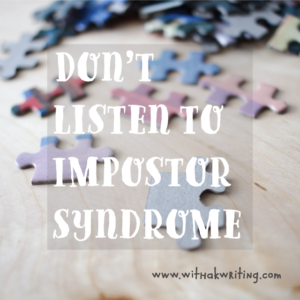 When I taught struggling writers at a local private school for students with learning disabilities, I met resistance and writer’s block like you have never seen. You have to understand that these kids – and adults – were rocking higher than average IQs, but they had these specific learning disabilities in the areas of reading and writing. It was basically my job to find their most stressful, hurt-i-est parts of learning…and then sort of poke ’em with a stick. I had this group of four middle-school boys that I taught in a writing workshop one summer. One boy in particular became *so* angry every time a white page was laid in front of him, and I couldn’t blame him. It was SUMMER! And I was making him do this thing that made him feel small and stupid and frustrated. It was horribly unfair. You don’t know resistance and writers’ block until you see a sweet, smart kid fighting against a learning disability like this guy had to. It was physically pained – his reaction to each empty page – and to me too. He was so mad that I kept pushing him through the steps. I was ok with that though; he needed someone to hate other than himself – and it didn’t last long. As soon as he let himself settle into the “one bite at a time” process, he had *so* many things to say, it was amazing. And he forgave me for forcing him to try it 😉 By the end of the summer, he was writing persuasive letters asking for his favourite series of books to be added to the library and very cool comics starring himself. Not kidding. This kid was a rockstar. We spent nearly the entire summer, working on Step 1 – Prewriting. We planned and plotted and did word-work and organizational exercises and even did some random dancing…well the dancing was mostly me…but anyway. I didn’t even let them start writing a draft for a whole month! This was because they – like most of us – were skipping the first step entirely. 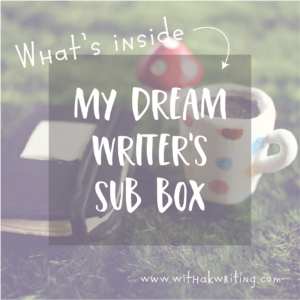 They were trying to plan, draft, edit and revise every word – ALL AT ONCE. If you are doing this, friend, you need to STOP it. You are only hurting yourself, and your writing. I’m going to really dig into the prewriting step over the next month, but I’ll leave you with this advice for today: if you are struggling with your next post (or report, or letter, or anything written ever), ask yourself this: “HOW DO YOU EAT AN ELEPHANT?” If your answer isn’t “ONE BITE AT A TIME” your dad isn’t as funny as mine, and you are likely stuffing too much elephant into your mouth and choking yourself. So stop staring at the page-elephant and start making a plan: outline it, draw it, make it out of play-doh, if you want. Just give yourself a minute to plan your writing first. When you plan it out and eat it one bite at a time, you are far less likely to choke on it. Comment below about how you attack writing, and how you avoid choking on elephants, and share if you know anyone who could be staring at a white page right now. Hey Annette 🙂 Thanks for signing up! I hope Keyboards and Kickstands is a valuable resource to you! 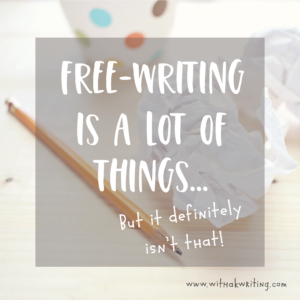 Look for some more Prewriting work this month and next, and some free worksheets with the membership opt-in. Wonderful post Kris! Can’t wait for more on pre-writing! Wish I’d learned this a long time ago! Hi Kris – I enjoyed reading your Blog. I carry around a notebook and jot down ideas, I’ve found over the years not to trust my memory! And if not in a desperate hurry, another words, not left it until the last minute, process it all in my head before putting pen to paper or fingers to the keyboard. Some people have told me that they can only write with a pen, others with the keyboard – I think you have to find the best method of getting it down for yourself. And yes, this was written without much planning or thought! Thanks for your comment, Lynne! I love using a combination of pen and keyboard too. A pen just feels more creative and open, but I can’t keep it organized or follow through to revision and editing on paper. Do you have a special kind of notebook you like best? The ones I love the most have just been discontinued, so I went and bought about 10 to keep in a drawer in my office. Ha! um Innocent until proven Guilty =OP what a great post you are so right we must not do everything at once . 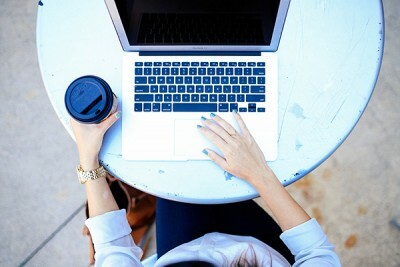 I love blogging and coffee! What can I say?! Combination of both is even better! Well written! Thanks, Hannah! You are talking right to my heart. Coffee is one of my favourites, for sure. I mostly write for my blog now and I find that uploading the pics first gets rid of the dreaded blank page. Then I have to tell the reader what the photos are for. This is by no means the end of my writing problems but it has helped. That’s a great Idea, Gina! Images are such a powerful tool for bloggers and for inspiration too. I am hoping to tackle some photography and even video this year, but you Creative Live photographers will have to be gentle with me for a while. I’m still a newbie with the lens. Awesome article! It was both informative and fun to read! I usually jot down ideas, thoughts and inspirations in bits and pieces whenever they come to me. Then I piece my writing jottings into a whole. I know! They are so *pretty* though. It’s hard to start filling them. Hmmmm….that reminds me, let’s go shopping for some pretty journals!